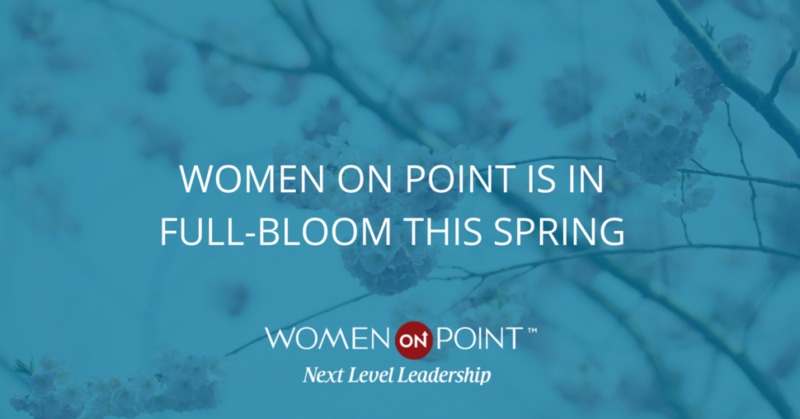 Flowers aren’t the only thing blooming this spring…Women ON Point is blossoming, blooming, and bursting with wonderful news! First of all, the Women ON Point leadership summit in Minneapolis on March 28-30 is officially OVER-SOLD. There were so many incredible women committed to investing in their leadership skills, we simply couldn’t say no. We have women coming from all over the country and from companies including 3M, Best Buy, Boston Scientific, Wells Fargo, Hyatt Corporation, Oracle, Medtronic, TCF Bank, Workiva and more. Second of all, our next Women ON Point leadership summit in Denver on September 19-21 is already half full. If you’re interested in attending or know someone who would be, please don’t wait….this summit is going to SELL OUT fast. Third of all, two of our Women ON Point alumni just appeared in the Wall Street Journal discussing the benefits of the experience and how the “Brag Book” has helped their confidence and their careers. Thank you Elizabeth (Elly) Bacon and Sherry Hicks-Buckles for continuing to be total rockstars and paying it forward…we are so proud! Read the article here. Fourth of all, we are thrilled to invite you and your girlfriends, colleagues, and co-workers to attend our next Women ON Point Networking Event on Wednesday, March 28 from 4:00 – 6:00 at the Hyatt Regency Minneapolis on the Nicollet Mall downtown. Please RSVP to Aimee at aimee@womanuppower.com. Last, but certainly not least…we are bursting with our new announcement! For three years we have been asked the age-old question after every summit, “What’s next?” Well, we can finally answer that question! We are officially launching our new Women ON Point 2.0 that will take place in Chicago on August 9, 2018. This is a one-day summit where we take a deeper dive into the most relevant challenges in our lives and the workplace today. Mark your calendars and register quickly. Click on the link. We hope you’re off to a wonderful start of spring, and we look forward to hearing, sharing, and celebrating so many of your success stories. Please keep them coming!